Alan Butler is currently in his second year of a three-year studio membership at Temple Bar Gallery and Studios in Dublin. 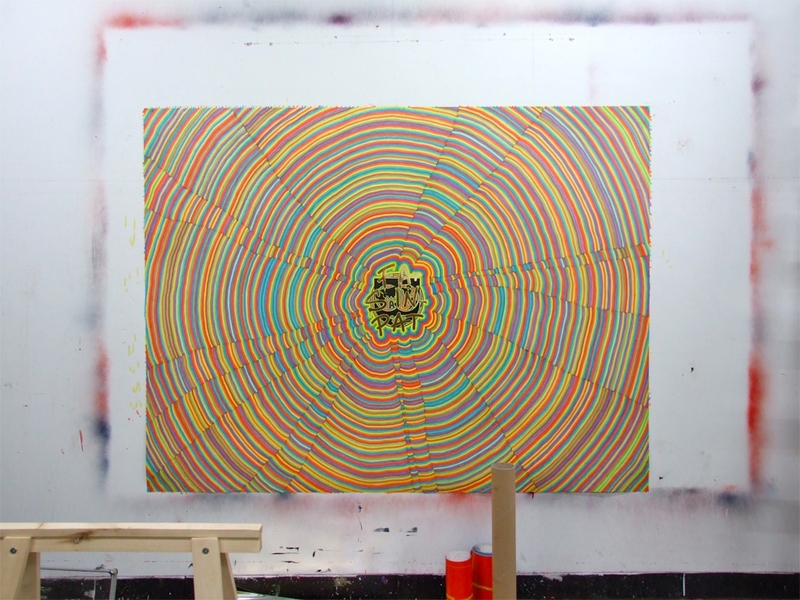 360 degree panoramic view of Alan Butler’s Studio – click here for interactive panorama. Image courtesy of the artist. 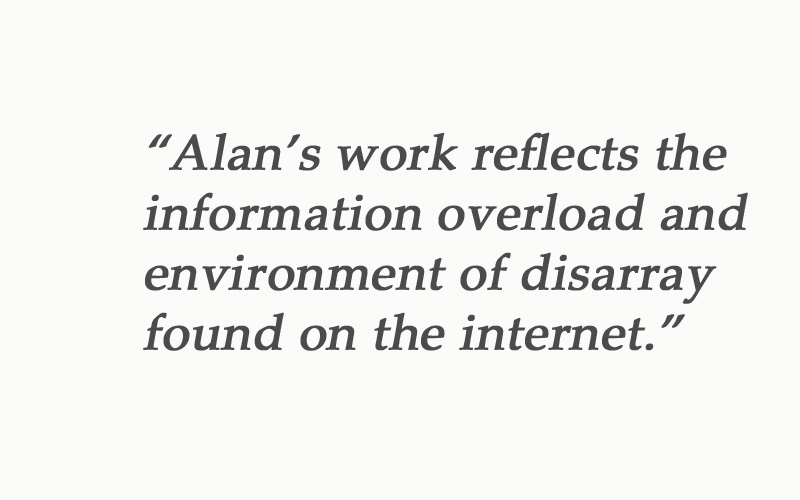 Alan has always been intrigued by the internet and usually incorporates it into his work in some way. He is interested in appropriating or re-mixing things that he finds on the internet in order to make work; this work varies from video to sculpture to drawing. He uses the internet as part of the process in making works, not as the focus. He is interested in the information overload provided by the internet and attempts to portray this through his work by reflecting this environment of disarray. Installation of Alan’s Internet Über Alles at the group exhibition ‘Experimenting with Clouds’ in Rua Red, 2012. Image courtesy of the artist. This is a reflection of how Alan sees the internet. He sees it as a fundamental structure that all the detail inside simply hangs upon. How we use the internet and the sociology surrounding that is something that inspires Alan to make certain works of art. He said that rather than critiquing the internet, he wants his work to be from the internet – as if a “relic from this other land that exists that everyone’s involved in”. The creation of his piece The Image Factory, 2008 – 2009 demonstrates the significance of the internet in Alan’s work. 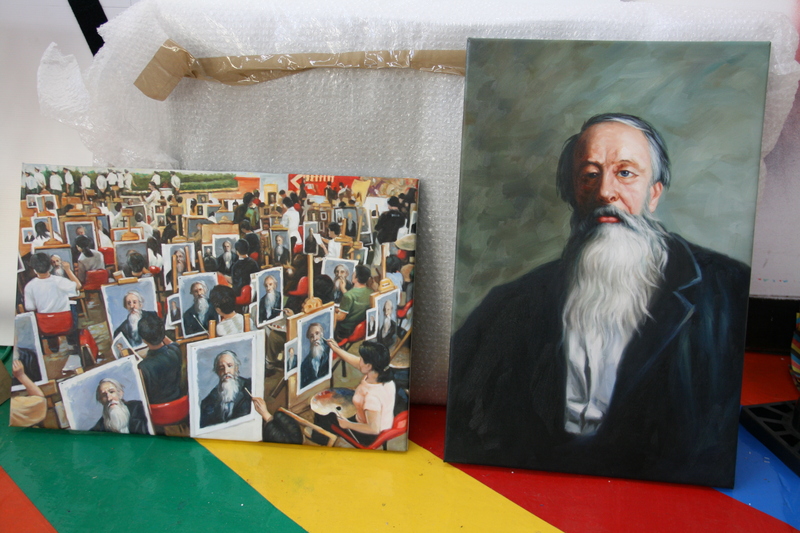 Alan came across an image on an Irish blog of a painting that portrayed people in a large factory in Daffen, China all painting the same man identically. It was a painting of a painting that was being mass-produced to sell on the Western market. This mass painting occurrence was a state organised event and a means by which thousands of artists from the area made their living. Alan wanted to get this image of the group reproduced as a painting so he emailed an address he had found on the internet for the factory in Daffen and asked if they could do this for him. He was sent the image of the man that everyone was painting. The Image Factory, 2008 – 2009 in Alan’s studio. At the time Alan didn’t think he would use this for anything but he was interested to find out who the man in the painting was. It turned out to be Vladimir Stasov, a Russian art critic from the 19th century, painted by Ilya Repin. This is when the work began to form for Alan. Stasov had been something of a tyrant and felt that Russian art that copied the West was second rate. Stasov felt that art should show people how to live their lives. This put an interesting spin on the painting for Alan. What had started out as a critique, using human labour as a process, ironically turned into Alan actually feeling that he had completed a conceptual artwork for whoever it was in that factory in China who had chosen Vladimir Stasov to be painted by thousands of people who make a living copying stuff for the west. In 2010 Alan made a video piece called Watch Us All Gavotte which synchronises 20 different people that had uploaded recordings of themselves singing the song ‘You’re so Vain’ on YouTube. Alan was interested in how the music industry looks at young people as a sort of pirate generation but he believes that people are simply doing what technology allows them to do and, in a way, what culture requires them to do. The title of the piece is a play on a line from the song “You had one eye in the mirror as you watched yourself gavotte”. The gavotte is an old French folk dance that usually involved a group of people dancing in a circle while holding hands. Apart from commenting on the vanity of video blogging, the online social element of this work was important because the people who had made these videos were able to ask for feedback on their performances from their peers. Before gramophones, people could only hear musicians at live gigs and music was generally passed down through local singsongs. 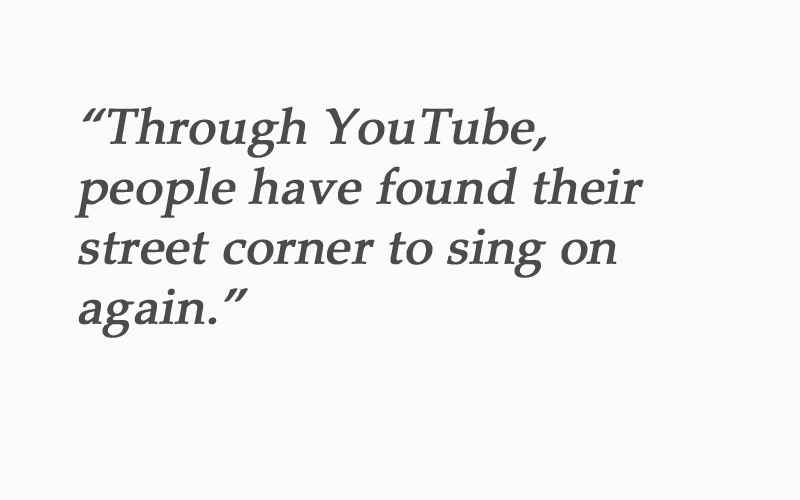 Alan said that through YouTube, people have found their pub or street corner again to sing songs that they like. Watch Us All Gavotte, 2010. Video courtesy of the artist. 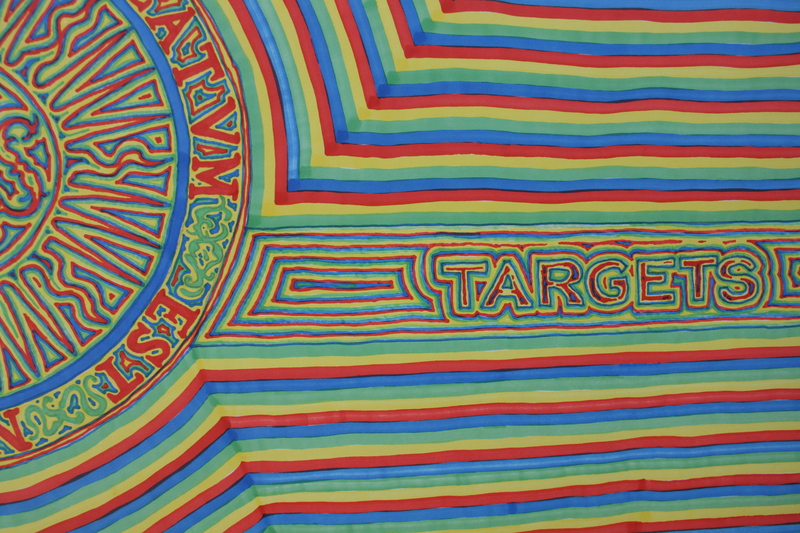 Detail of one of Alan’s works on paper. Fat Saint Pat is a work that Alan created over an IMF logo in 2011. In the centre, made from adhesive vinyl are the words Fat Saint Pat but what is mostly visible are the words “FaSinPat”. After the IMF had been to Argentina this slogan appeared outside a ceramic tile factory that had been closed down. The workers of the factory were determined to keep their jobs and so took over the factory themselves and eventually it became profitable again. It then became known as FaSinPat which is short for ‘Fábrica Sin Patrones’, which means ‘Factory Without Bosses’ in Spanish. The exhibition that Alan made this work for was in Washington DC in an Irish cultural centre. It was called ‘1.7 Trillion Euros’ which was at the time the combined public and private debt of Ireland. He said that one of the important things about this work for him was the conversations that happened at the opening as a result of it. It encouraged a dialogue about what was happening in the country at the time. Fat Saint Pat, 2011. Image courtesy of the artist. Here They Come is a large work that Alan made in 2012. The work reconstructed a version of an obscure dog character from the Dire Straits ‘Money for Nothing’ video. This was the first video ever shown on MTV Europe in 1987. At the time MTV was seen as a radical youth movement coming from the States to take over the world. Alan began to think about that in relation to the Occupy Movement that was happening. He visited camps in Washington DC, New York and beside his studio in Dublin and said they all looked almost exactly the same because the Occupy movement was a brand set up by AdBusters. Alan said that he admired what the groups were trying to do but in reality he felt that the movement was really just going to be one of the many inconsequential stories about the larger economic and political catastrophes that were happening around the world. This is how the large wooden dog character came into existence. 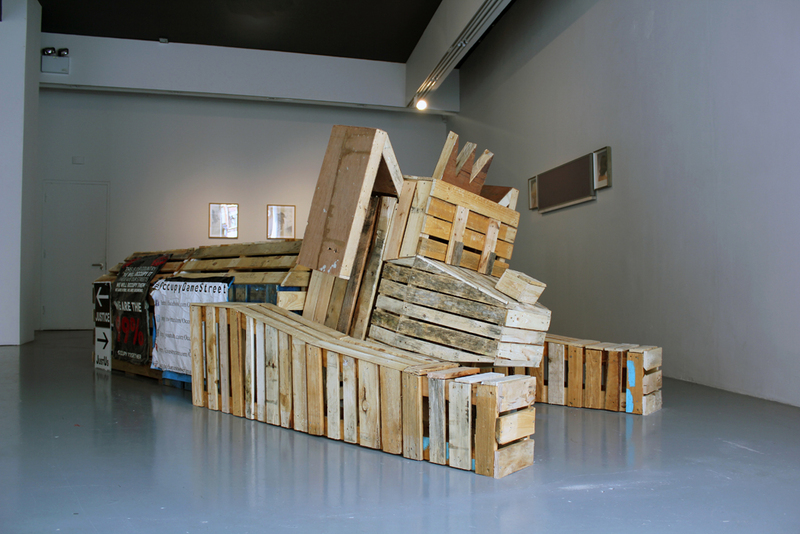 It was built from pallets identical to those that were used to construct the Occupy camp in Dublin and posters that he had acquired from the camp when it was deconstructed. These wooden pallets were signifiers of the camps all around the world. Alan is not particularly concerned with the fact that on seeing the dog in a gallery this story would not be apparent to the viewer. He said, quoting Adam Curtis, that he hopes it is a product of its time. Here They Come, 2012 installed at the exhibition ‘Entrance, Entrance’ in Temple Bar Gallery and Studios. Image courtesy of the artist. This summer, Alan will be travelling to Seoul in South Korea for a residency in Seoul Art Space Geumcheon, taking part in a group show in FLOOD gallery as well as taking part in an exhibition that is based on a government study based on the lives of hundreds of nine-year-olds living in Ireland. For this exhibition the artists involved have been asked to respond to a document called Growing up in Ireland and reconsider, but not change, their practice while keeping in mind that their primary audience will be nine-year-old children with accompanying adults. Alan said that there is always the temptation to do something totally different and wacky because it will be a new audience for him, but to not do this will be the challenge.